Mackie's desktop controller offers source selection, monitor switching, and talkback facilities, all in a single robust box. Apparently the phrase 'big knob' doesn't have the same connotations in the US as it does in the UK, but Carry On-style jokes aside, Mackie have come up with the most elegant DAW monitoring controller I've come across to date, at least at the kind of price a UK home-studio owner can afford. It doesn't support surround monitoring, but offers pretty much everything you could wish for in a stereo, computer-based home studio. Essentially, the Mackie Big Knob gives you all the features you'd expect in the master section of a medium to large mixing console, allowing you to select monitor sources, choose between different monitors, and provide a talkback facility to the studio. It also has a couple of two-track outputs and a DAW output, to all of which the selected input source is simultaneously routed. While it's not the only product to offer such facilities, the Big Knob is a little more flexible than most insomuch as multiple sources can be mixed and rear-panel gain trims allow different monitoring systems to be balanced in level. Designed for desktop use and powered from the mains rather than from a power adaptor, the Big Knob can select between four stereo input sources, one of which is the stereo monitor mix from your DAW's soundcard or audio interface. These can be routed to any one of three sets of monitors plus four sets of stereo outputs, and there's also a built-in headphone amp with two headphone outputs for headphone monitoring in the control room, as well as a separate stereo studio output that can be sourced from the selected input source or from an external stereo source such as a DAW's aux send. Most of the inputs are switchable from +4dBu to -10dBV, or have gain trims, and all the signal connections other than the Phono inputs are on balanced jacks. The Phono inputs are designed to be used with a record deck fitted with a magnetic cartridge and have the necessary RIAA equalisation. Selected sources are routed to the control-room buss, which in turn also feeds the DAW output and two two-track outputs on balanced jacks, allowing the output from a record deck to be recorded back to the DAW or to a two-track recorder. All four sources and all three monitors have rear-panel gain-trim pots, and all the outputs (2-track A, 2-track B, DAW Output, and Phones Amp) are switchable from +4dBu to -10dBV. The whole unit is built in traditional Mackie tank-like style, and slopes forward for ease of use when positioned on a desktop. 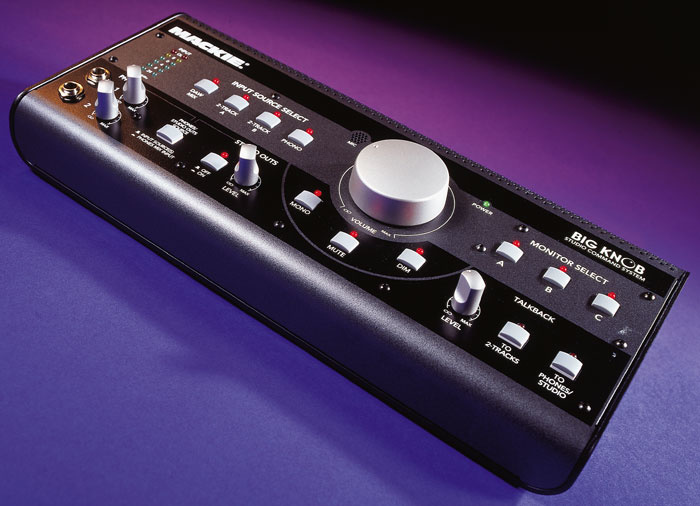 The cosmetic styling matches Mackie's original mixers and Mackie Control, and the unit is solid enough and heavy enough not to get dragged off the table by the weight of any connected cables. Mackie have been very careful to make the signal path clean and quiet so that your monitoring won't be compromised. The spec shows the frequency response to be essentially flat from 10Hz to 50kHz, and only 3db down at 100kHz, while EIN is 119dBu maximum and the dynamic range 112dB minimum on all paths except the phono ins (which have a 93dB minimum dynamic range). The input trims have a ±10dB range, while the output trims go from -14dB to 0dB. Certainly the unit seemed as quiet and as clean as a Mackie mixer. Input-level meters and the four input source-selector buttons are at the top left of the panel, with the phones and studio output section beneath. Multiple sources can be selected at the same time, in which case they are mixed to the control-room buss. This is most useful if you want to play back a CD or sequencer track and jam along with your guitar preamp, for example. Both the phones and the studio output are fed from the same source, which can be switched to follow the main control-room source or the stereo DAW Phones Mix Input on the rear panel — this could be fed from a DAW stereo aux send or other source to provide the performers with a different mix to the one the engineer is hearing. Both phones outputs and the studio outputs have their own level controls. The centre of the Big Knob is, predictably enough, dominated by a big knob, the purpose of which is to allow you to keep a firm grip on your monitoring levels. This is accompanied by Mono, Mute, and 20dB Dim buttons, though there's no option to solo the left and right monitors independently or hear them out of phase in mono, which I know would not please our Mr Robjohns — these were facilities the BBC insisted upon. A small perforated section of panel hides the talkback mic, and there's also a small power LED as well as red status LEDs on all the buttons. No blue-LED posing here! The internal talkback mic can be routed to the DAW output or used to feed the studio headphone amp for communicating with the musicians in the live room. Two Talkback buttons are provided, one for 2-track and one for Studio Phones, and both of these are non-latching to save embarrassment when you slag off the drummer thinking the talkback is off! Monitor selection is to the right of the knobicus maximus, with the talkback buttons and talkback level controls directly below. On the rear panel there's also a footswitch jack for hands-free talkback switching. At 3.5Ibs (1.6kg), Big Knob sits firmly upon the desk and is well set out from an ergonomic point of view. Although simple to use and pretty foolproof, the four stereo outputs are always active, which means inappropriate use of your Big Knob might get you into trouble. Specifically, you can end up in a situation where you create a feedback loop — for example, where a stereo tape machine is connected to both the inputs and the outputs and the tape machine's input monitoring is turned on. Avoiding such problems requires only a little care on behalf of the user, and the Big Knob's approach here is certainly less rigid than that of competing devices that preclude certain routing options. Not only does the Big Knob fulfil all the basic stereo requirements of a DAW studio, it also allows CD players and guitar preamps to be played through the monitors without having to switch on your DAW. In my case it also makes it easier for me to review and compare different sets of active monitors, as I can connect these to the spare monitor outputs, trim the levels to sound the same, then switch between them. While the Big Knob might face some stiff competition on cost, it is the best-designed, best-packaged controller I've tried at anything like this price. In picking the right features, I think it's safe to say that Mackie have really pulled it off this time. You can route signals to the DAW from external devices, route mixes to other hardware recorders, and even transcribe vinyl. Passive solutions may retain the moral high ground because they put no circuitry other than relays in the signal path, but the ability to mix multiple inputs as you can here is occasionally very useful. It's no good — I'm going to have to buy one! Solid build quality with large controls and good LED indication. All balanced connectors with gain switches and trims where required. The Big Knob stands proud as an ideal control centre for any mixerless DAW system, with a good choice of source selection, including phono record-deck inputs.